Our job is not complete until you are bed-bug free. This is a huge relief for most, because the last thing people want is to live with bed bugs for two more weeks. 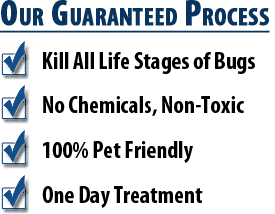 With our guaranteed heat treatment, you can be bed-bug free the same day of treatment! Bed bugs are all we do. Most pest control companies offer “bed bug services” as well as a handful of other services, but they are not bed bug experts. 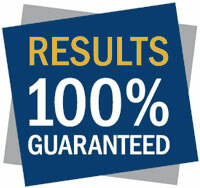 They can’t make solid 1-year guarantee because they don’t have the knowledge and expertise that we have. Bed bugs are all we do. We know where they hide, and we have the best techniques and guaranteed process to get rid of bed bugs for good. Do I Still Get a Warranty If I Get a Chemical Treatment Instead? Absolutely! We offer a range of different warranty periods for chemical treatments. We offer chemical treatment warranties ranging from 30 days to 6 months. It is best to schedule a free inspection so we can see the level of your bed bug infestation and advise you on the recommended route of treatment. 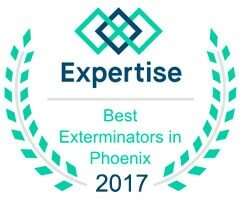 If you are ready for a proven and guaranteed way to get rid of your bed bugs, call the Phoenix Bed Bug Expert at (480) 351-6545.